Described as an ‘immaculate player’, Fred Allen went on to become the most successful All Black coach ever: during his tenure, between 1966 and 1968, the team won all 14 tests. His renowned skill for motivating his players earned him the nickname ‘The Needle’. Allen’s contribution to New Zealand rugby was recognised with a knighthood in 2010. He is unique in having been inducted twice into the New Zealand Sporting Hall of Fame – for his coaching achievements and as a member of the army team. On the international stage he was recognised with induction into the International Rugby Hall of Fame in London in 2005. Fred Allen was born in Oamaru and played for Canterbury before the Second World War. He came to national attention as a leading figure in the NZEF ‘Kiwis’ Army team (Khaki All Blacks) that toured Britain at the end of the war. 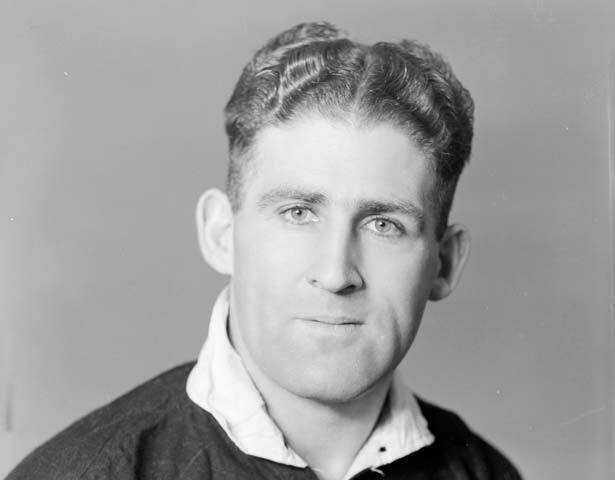 Described by the famous rugby commentator Winston McCarthy as ‘absolutely immaculate in his football … a beautiful footballer’, Allen settled in Auckland after the war and made his debut for the All Blacks in the two-test series against Australia in 1946. He captained the All Blacks in all of his 21 games in the black jersey, including six tests. The Encyclopedia of NZ Rugby described Allen as ‘one of the greatest post-war All Black backs playing equally well at either 1st or 2nd five-eighth’. Winston McCarthy named him ‘one of the finest five-eighths of all times’. The 1949 tour of South Africa marked the end of Allen’s playing career. While the test matches were close affairs, the Springboks triumphed 4-0. Allen, who also shouldered much of the responsibility for coaching on that tour, was hampered by injuries and stood down from the final two test matches. Having hung up his boots, he turned to coaching. It was in this role that he truly stamped his mark on Auckland and New Zealand rugby. As Auckland's selector-coach from 1957 to 1963 Allen became one of the most successful Ranfurly Shield coaches of all time, helping make Auckland the dominant force of New Zealand rugby. Higher honours followed and he became an All Black selector and then All Black coach in 1966. In his 14 tests as coach the All Blacks were not only unbeaten but gained widespread admiration for playing attractive running rugby. We have 12 biographies, 6 articles, related to Fred Allen.